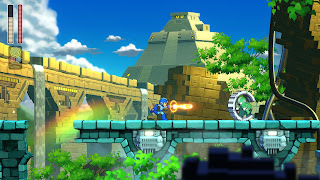 Rockman Corner: New Mega Man 11 Trailer and Details! Coming October 2nd! New Mega Man 11 Trailer and Details! Coming October 2nd! Mega Man 11 is officially headed to home consoles and PC on October 2nd, Capcom have announced. Not only that, the house that built the blue bomber has dropped a brand-new trailer and TONS of details! Hit the jump below – do it now! "It’s no surprise that the mustache-twirlingly evil Dr. Wily is up to his old tricks, but this time the master of malevolence has a brand new tactic tucked away in his lab coat. Reflecting on his younger days when he studied alongside Dr. Light – the good-natured and ever-hopeful creator of Mega Man – Wily recalls a creation of his own: the Double Gear system, capable of pushing robots beyond their normal capabilities. Putting his idea into action, the unscrupulous doctor steals eight of Dr. Light’s robots to use for his own nefarious plans. 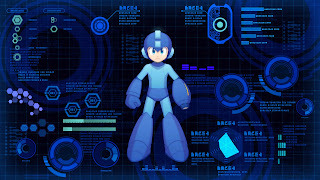 At Mega Man’s request, Dr. Light installs the prototype Double Gear system in the heroic blue ‘bot, imbuing our hero with brand new skills in his quest to put a stop to Dr. Wily’s diabolical plan and continue the fight for everlasting peace!" 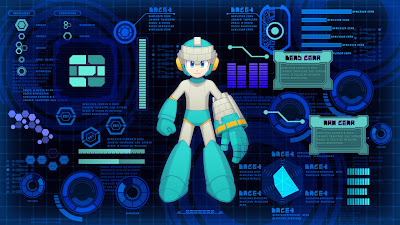 Overdrive Mode - When at critical health, Mega Man will gain access to a hidden ability to activate both gears simultaneously, unleashing maximum power and allowing for deft maneuvers in the direst situations. "Block Man! This vain, brick-building ‘bot has an ego the size of a pyramid, and a bit of a hero complex to go with it. Headstrong and thick as a brick, Block Man is able to form blocks out of thin air, and can use the Power Gear to change into a gargantuan form when he’s pushed to his limits. 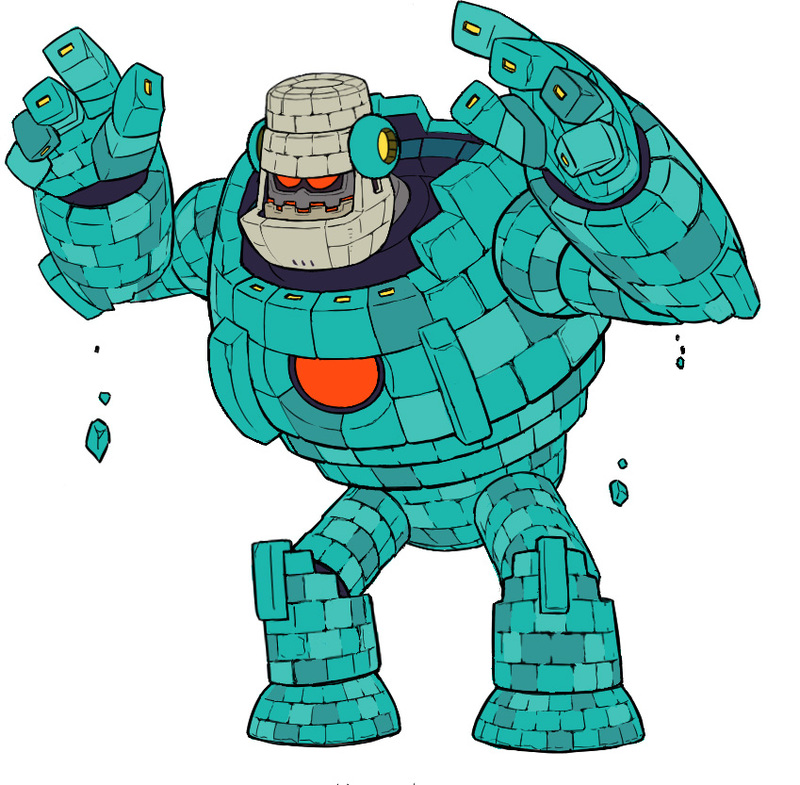 This rock-solid Robot Master is definitely no pushover, but you’ll have to navigate a series of perilous pyramids in order to reach him." 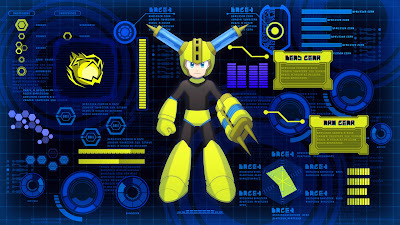 "Fuse Man! 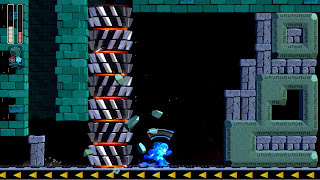 This fast-thinking Robot Master resides deep within a power plant, filled with challenging platforming and tricky traps. Never one to refuse a fight, this speed demon will charge you with assault and battery if you’re not careful. Getting to his lair to begin with is a challenge on its own, with lasers that will require quick thinking to maneuver around and lots of electrified surfaces that will give you a jolt if you don’t watch where you step!" 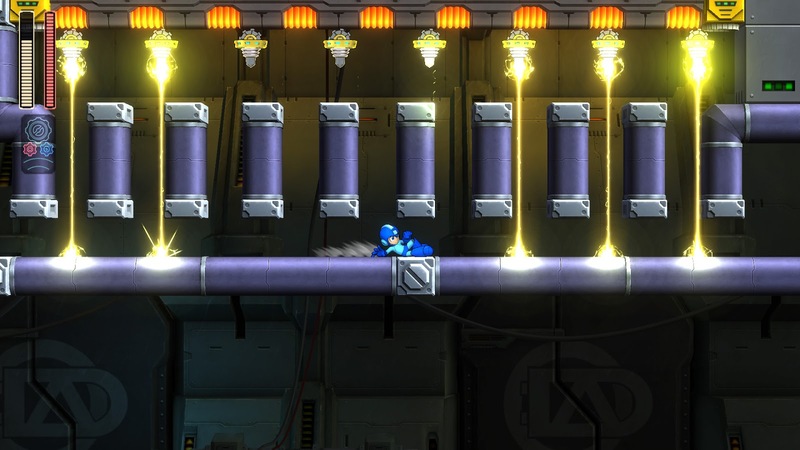 "New to Mega Man 11 is how parts of Mega Man’s appearance change when he equips a Robot Master’s weapon, giving him a distinct look reminiscent of the Robot Master he’s acquired each weapon from. It’s also easier than ever to choose a power to use thanks to a new weapon wheel that can be accessed with a flick of the right thumb stick, letting you switch weapons on the fly. 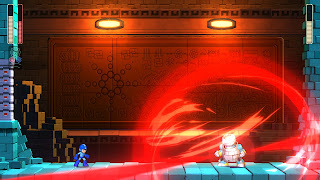 Helping Mega Man in his fight for everlasting peace, Roll and Auto can create useful upgrades and items to upgrade Mega Man using bolts scattered throughout stages and dropped by enemies, giving Mega Man even more versatility for combat than any previous mainline Mega Man title before." Pre-orders for Mega Man 11 are now available through Capcom with others to follow shortly. Pre-order through "qualified" retailers (Amazon, GameStop, Best Buy, PlayStation Store, Xbox Store, Nintendo eShop, Steam) and you'll receive "a FREE suite of eight alternative, in-game instrumental piano arrangements for the stage themes when Mega Man 11 releases." Pre-ordering the game on PlayStation Network yields an exclusive Dr. Light's lab theme. Grab it here. The game will have a psychical and digital release in North America (and Japan) for $29.99 across all platforms. That boss theme is sweet. The whole game in general seems to be developing the way I feel it should. Voice acting, modern graphics, all the old abilities and a new one. I get the feeling this'll be a great addition to my Switch's library. I'm still curious as to what the drawbacks of that Gear system, are, though. I know it has an energy meter attached, but the whole "pushing a robot beyond their normal capabilities" makes me think there'll be a sort of system where you can continue using it after you've run out of energy, at the cost of something else. 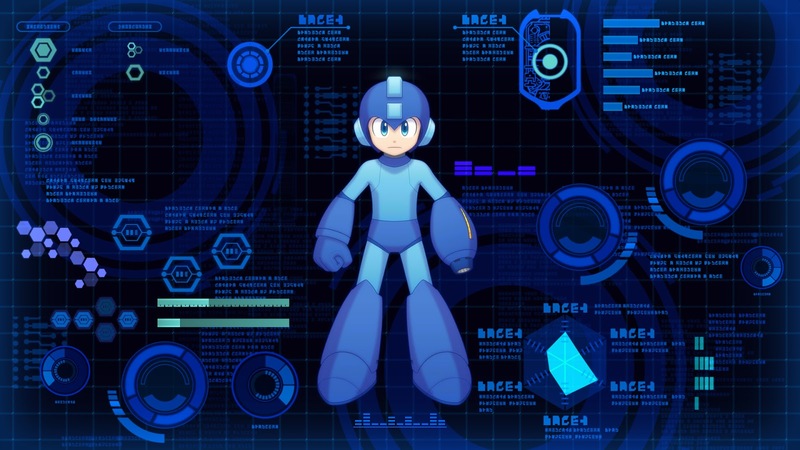 The gauge is a heat gauge, and if it completely fills up, Mega Man overheats and breaks the Double Gear system until he cools down completely. If you use the hidden Overdrive mode and max that out, not only does it break the Double Gear system, but it also leaves you with 1HP and no charge shot until your systems cool down and you get some health recovery. $29.99 is good. Hope all those people who jumped on the person who commented that being a good price point apologize to them. As for the footage, I'm liking what I'm seeing so far. Levels look a bit more complex than the older games. Seems like there's a bit more going on. Block Man having a big form thing makes me optimistic about the boss fights. Could be some of the most interesting ones in the Classic series. Animation looks a little off in parts still, but it's fine. Voices though, not a fan. 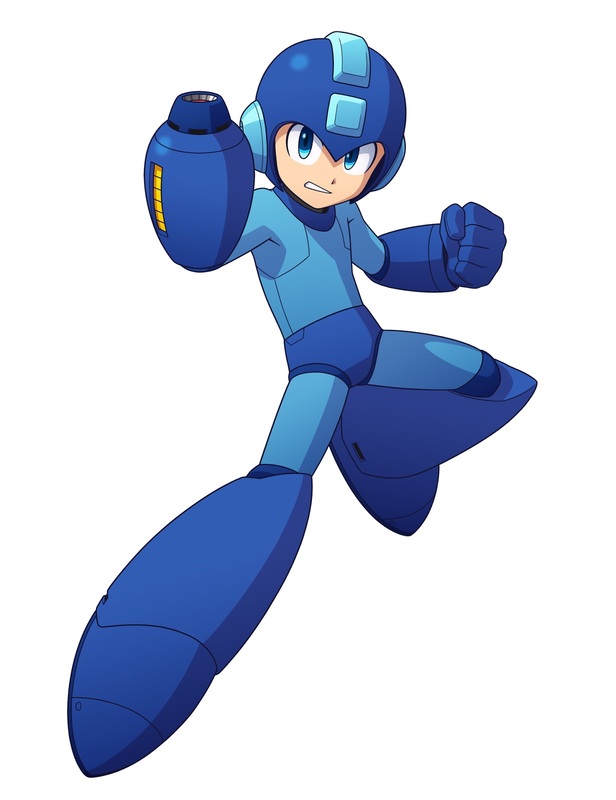 Mega Man's is probably the worst of the bunch too unfortunately. Hopefully there are some options for that. The voices are fine. Don't ruin this for everyone with dual audio whining. I have one complaint in a comment full of praise and you say I'm going to "ruin this for everyone" with "whining" huh? It's fine if you have a different opinion, but you don't need to be so idiotically dismissive or hyperbolic about it, nor is there anything wrong with wanting an option for dual audio or even a simple voice volume option. Rock's voice is terrible, but according to gamexplain dual-audio is confirmed, so nothing should be ruined for anyone. The one being idiotically dismissive here is you. anonjerkface? Seriously, JLunaarS? What are you, eight? Thank you both very much for letting me know. And no worries, I won't let some random comment detract from anything for me either way. If you're trying to have a conversation in a comment chain it's a good idea to point out who you're talking to. But if you were talking to me, the original one who left the comment, then I need to ask in what POSSIBLE way was I being dismissive? I even said if they were fine with the voices, then that's fine. Others agreed that other anon was the one in the wrong with their comment, and there's a reason for that. I found the voices on the bosses fitting. Mega Man's however, is too low for my liking. That's fair. I think most of the English voices are actually mostly fine, I even like Dr. Light's personally. Mega himself is a bit off in my opinion though, for a similar reason. I think he's calling you, Original Topic Poster, idiotically dismissive because you went on the offensive and a few others attacked the poor guy in the process. The voices especially of Mega Man's are fine and much better than the hyper feminine english voices of old games like Mega Man 8. I'd rather the pendulum slightly swing toward sounding like a late teen sounding voice for a "kid" like Rock than massively swing towards a feminized one. Also the acting is better than the old games too, nothing seems overdone or super mono and lazy its not obnoxious without being boring. That "poor guy" is the one who initially went on the offensive by dismissing what I said as "whining" because I had one point of criticism and claimed I was "ruining things for everyone." In no way did I start with a condescending or offensive tone, that was him. I responded to that tone in kind. Nothing I said even fit the description of the word "dismissive" either. So if that's his reasoning, I'd say it's foolish as well. That's a fine opinion to have, regardless of whether or not I agree with it personally. I would ideally like Rock to have a child like voice that actually sounds child like, but considering we have had a good number of games where Rock has sounded particularly feminine as opposed to actually child-like, having him sound so much older is fine for a change of pace if nothing else. voice work is kinda what i expected. its juuuuust corny enough without being ear splitting bad. nothing that screamed mute, but not award winning for sure. i'm fine with it, really. does not bother me at all. Megaman doesn't sound like a kid, anymore. He actually kind of sounds like one of those awkward teens that work at Jack-in-the-Box, to me. I don't like that. 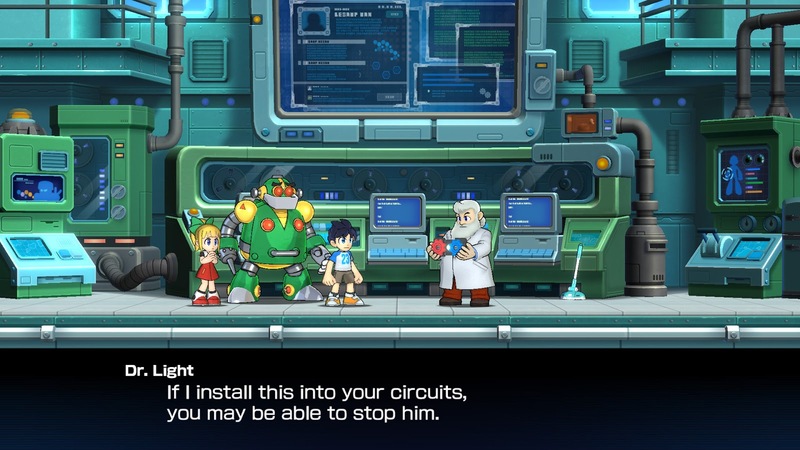 Dr. Light and Dr. Wily sound about right, though. At least, compared to their (original) Japanese voice actors. (Basing this in Battle & Chase, mind you.) I think I'm okay, with that. @Joseph Collins: Yes, the Powered Up Canadian VAs were a very solid fit, considering they've done dubs of anime in the past. I recognized quite a few of them too. As for the Wily voice inquiry, a good question. From the trailer, it sounds like Hirohiko Kakegawa to me, who incidentally replaced Aono as the voice of Mihawk in One Piece. will it have costumes like the star force costume from the screen shots ? The Star Force costume is a boss weapon, not an actual costume. Don't deny it's a reference! I just think it's more likely to be a weapon than a full-on costume, my guess is it's the blue/red RM's (top right in the stage select screen) weapon. But you're right, we don't know for certain and I should've specified it's speculation on my part. OMG!!!!! It looks awesomely beautiful! Keith Silverstein (Professor Tomoe from the new dub of Sailor Moon) as Dr. Wily and Ben Diskin (Umino from the new dub of Sailor Moon, Jusis Albarea from Trails of Cold Steel) as Mega Man? Sweet, super professional VAs have signed on! Just gotta decide were to get my copy now. Gotta say, Fuse Man looks pretty dope. Somehow, the fuse things on his head do not detract from his sweet design (though sadly, they don't look as good on Mega Man's head). Agreed 100% Was discussing the same exact thoughts. Oooo looking good so far :) need to actually watch the trailer later when I get the chance, but this looks very promising! 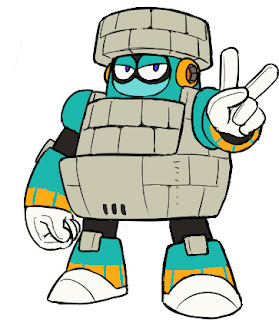 I like the new designs for the robot master powers! Very reminiscent of exe where he takes on their traits and not just a pallet swap. AND WE ARE BACK! Love the music, and the double gear system looks like a good addition to Rock's powerset. This game is shaping up very nicely. I'm in awe at how amazing this looks! Game looks interesting, but those voices are making me pine for Captain N: The Game Master. Sure hope there's a Japanese audio option. Not necessarily. Something like Sonic Mania was sold for only $20.00, and I'd be surprised if this game has as much content as that one does. I don't think them charging 30 bucks for this is telling of anything other than what they think they can ask for it, given what it is. If anything I think it's more indicative that the collection games fall closer to the "cash grab" side of things. 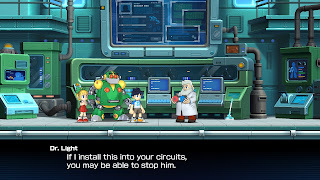 Interesting... Dr. Light and Dr. Wily abandoned an old prototype Double Gear system before they created the robots. i'm looking forward to the release of Megaman 11 and the game play. 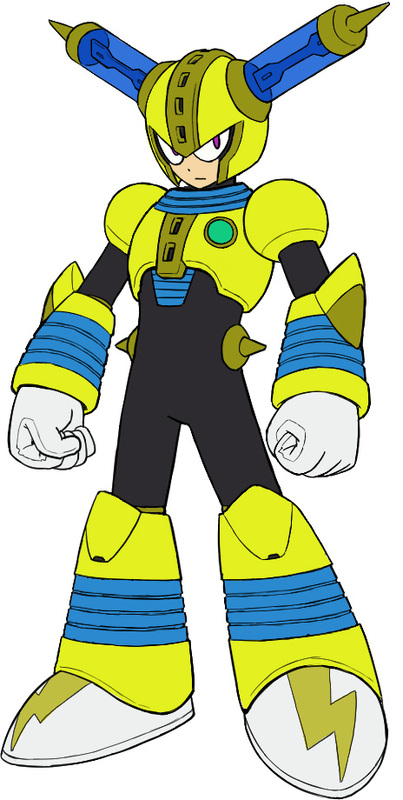 Very tired of surfer bro voices, especially for Mega Man. Is that the only shtick English male voice actors have? I'm giddy! Going to pre-order for Steam ASAP. 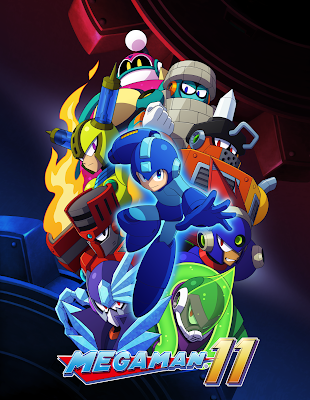 Don't even have a PC able to play this on, probably won't by release either, but I'm so glad there's a new Megaman I gotta support it. Huh, so the robot masters are Light's? The Japanese description states that the research of the Double-Gear System, forced to shut down due to heavy risks, was what started the divide between Light and Wily. It seem Wily finishes it now, while Light aquires Wily's original prototype and uses it on Rock. I wonder if the new staff will be adding and filling in the gaps of lore? Hm. The plot seems pretty serious, despite the cartoon-y graphics. It kind of reminds me of 8, & Forte, and 10. That's not a bad thing, at all. Can't say I like the idea of forcing a new game mechanic down the player's throat, though. (*cough* "Xel Absorption" *cough*) I'm also not sure about the whole ReXelection– whoops, I mean "Style Change," whenever Rock changes weapons. I mean, it's different… but, not really? The dedicated "utility" button is always a good thing, but I wonder if there'll be a dedicated Buster button, too. That was handy-as-hell, in 8. Boss Names: Block Man, Fuse Man, Blast Man, Impact Man, Bounce Man, Tundra Man and Torch Man. Hah, neat. Yet another boss that shares a name with an MS-DOS game boss. Still waiting on Sharkman, Bitman, and the trio from the first game, Capcom! Just a heads up, Amazon has a 20% off promotion for Amazon Prime members who preorder the game. Looks like it applies to all platforms. I preordered the Switch version and the grand total is $25 and change.